Many people have posted their six month update. Well, that slipped past a month ago. I guess time flies when you’re walking again! This is four months after going into two shoes. The repaired AT is pretty thick but getting more limber each day. There is still a lack of strength and I can barely get up on a one-legged toe lift. I know there is still a ways to go but, aside from not running yet, most things have returned to normal. I hope this might be of some encouragement to all our unlucky newcomers…no matter how sucky it may seem, it will definitely get better. Trust me on that one. And I really can’t thank the blog enough for all the support–in terms of advice and encouragement. Especially Dennis and Kristin. And if you read this, Walshie, I’m back on the damn Nicorette. New Year’s Resolution…yet again. Here’s to a kickass 2009. It’s been a long road with this damn wound and I appreciate all the support. At twenty weeks and one day, the good news is that I am on the last mile of my wound marathon. Once we began the aggressive treatment of debridement (digging out the slough, which is the yellow goo) and applying Silvadene (antibacterial agent with silver nitrate particles), the healing began. 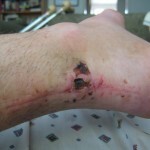 These wound complications are somewhat rare (so are re-ruptures…ha!) but doctors don’t seem to have any universally agreed treatment methods. So I hope that this may help someone else. I wish all my brothers and sisters good healing. I see that a lot of “old-timers” have recently posted and figured I hadn’t in a while myself. As some of you know, I was a re-rupture AND had a wound complication. But after the longest summer of my life, this past week has been a good one! For the first time since the end of April, I left the house wearing two shoes. And it felt terrific. Also, I drove my Jeep–which is a standard and hasn’t been driven all summer. The battery was dead but just needed to be recharged. I have been doing a self rehab as my doctor, my very conservative doctor, has decided that I should not go to PT. His main goal has been strengthening the AT with stretches, Theraband, a lot of boring time on an exercise bike and icing. The AT feels great. I have a little limp, which is to be expected, but no pain and little swelling. Every day it seems like it gets a little bit looser. I have a doctor’s appointment on Wednesday and I’ll be curious if I even need PT at this point. My wound also has been closing so very slowly. It has gone from 10mm by 10mm down to 3mm by 3mm. Fortunately, it is above the back of my shoe with the wedges I have so it has not been a big problem–aside from knowing I have a hole in my leg. But the recent exercise has increased blood flow and more healing (the nicotine gum I have reverted back to probably doesn’t help–I know, Walshie, I know). And just one more shout out to Kristin in Atlanta. She was a bright light during the dark days of The Hole. Her kids are lucky to have her as a mom and hope they got back home after I refused to answer the door (I did leave bus fare in an envelope). Dennis’ post about playing basketball again got me thinking. Once I am healed, I’m not sure I want to take a risk again because I’m not sure I can throttle down. I’m sure that playing the same level as I did when I was in my twenties caused the ATR in the first place. But we’ll cross that bridge–without a limp, of course–when we come to it. Like everyone else in this family, I’ve been reading all the newcomers’ stories and can only add that it does indeed get better, much better, down that road. PS. No kids were abandoned during the course of this AT recovery. It’s an inside joke if any of you are horrified. Actually, I almost made it to six weeks the first time. But it’s pretty nice to have made it fifteen days further this time out. So, to recap, I have had two surgeries and am on my third doctor in the clinic. Went in and met the old-school doc who, as it turns out, had trained the surgeon who operated on me. My new doc looks like he stepped right out of a Norman Rockwell painting…with the corresponding manners. Incredibly pleasant and more than happy to answer all of my questions. He’s very conservative in his approach to recovery and I’m fine with that. I have a wound that is slooooooooow to heal. He put on those mad scientist goggles and got to work on it with a pair of tweezers. Took out two suture pieces (yikes) and flicked off a large scab that had been hanging around for weeks. As he was about to pour hydrogen peroxide to clean the wound, I mentioned that I was told that it also kills the good cells. He said, “hmm….I guess you can still learn something everyday.” And then proceeded to still pour it all over my scar. He said I should change the Band-Aid every day but I have gotten other advice which I think I trust more (thank you Kristin!). Also, he said I should wash it in the shower normally. That, I’m not so sure about. After poking around the wound itself, he wants me to return next week to check its progress (my sixth post-op visit since the second surgery…can’t complain that I’m not getting attention, I guess). We’ll lock into a rehab plan at that point. Other people have asked the strength of the AT during recovery. My doctor said it could range but, erring on the safe side, he said it was currently only 25-30% of normal strength (at eight weeks). It will be 80% at four months and 100% at six months. So, all in all, not too much different from all you one-timers with conservative docs. Good healing to all of you, Team ATR. They say the group is always smarter than the individual. So I thought I’d throw this one out to y’all. I had an open wound from my second surgery. It has finally scabbed over by leaving it out of the boot and exposed to air. Certainly has taken awhile…over a month. Fortunately, no infection. My question: now that it has scabbed over, do I treat the scab with anything (Neosporin, etc.)? It’s getting better but sloooooooooowly. Day 29 - Crutches for Sale! Just finished my fifth PT session and I am now cleared for FWB. I could jump for joy. But I won’t. For all of you just starting down this road, once you get out of the woods after the first couple of weeks, there is definitely some light at the end of the tunnel. Someone suggest burning the crutches. I looked into that. Aluminum, it seems, has a melting point of around 1220 degrees Fahrenheit. I guess shoving them in the corner is a second best option without a basement blast furnace. Keep up the good work, y’all. There is still some swelling in the foot and the bruise is slow to disappear but the AT seems strong. 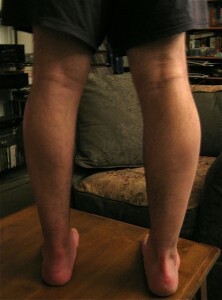 I am now doing out of boot exercises at home including toe curls with a towel to keep the muscles in the foot working. Not to rub it in to anyone stuck in a cast but the best part of this protocol is taking the boot off at night. I still wrap the ankle in an Ace bandage for protection. I mentioned in my last post that I was taking SuperCissus RX which is a joint supplement. I can’t say that it has drastically improved anything but the soreness in my good heel/AT is pretty much gone. Of course, that could simply be my body adjusting to the extra stress that I had been putting on it. Also, I am PWB so that lessens the weight on the good side as well. I plan to continue taking the supplement through at least Week 12. Wish I could recommend it one way or the other. Now that I have tasted the pedals of a bike again, I am going to buy one. I know we have a lot of cyclists here and was wondering if anyone had suggestions for a bike. I was looking at the comfort/hybrid/urban bikes. My old routine was to walk two to four miles a day to run errands. I still want to do that but a bike will be easier. Main use will be roads and the beach bike paths on occasion. Plus, until I am road worthy, I will probably get an indoor trainer for home exercise. Any tips or thoughts would be appreciated. Keep up the good work, y’all. You will be back on two feet before you know it. I promise. 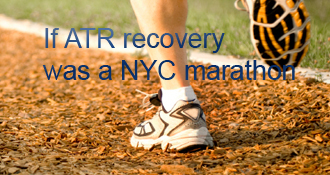 Just ran the first mile…on the NYC Marathon tracker, that is. Only 25 more to go! My at-home exercise is simply curling the foot back and pushing it forward. I have two sessions a week and will gradually move into more extensive exercise…stationary bike, etc. My protocol calls for this early, out-of-boot PT to help increase the healing. The good news is that I am allowed PWB at this stage. I can put up to 50% of normal weight on it. But, frankly, I’m a little scared to go that far so I plan to ease into it. The other good news is that, although elevation is still suggested, I don’t need to wear the boot at night or on the couch. I plan to wrap the ankle in an Ace bandage as a precaution though. I’ll be stretching the good AT/calf as well. The best exercise is to push against a wall at an angle but that’s kinda hard on one foot. So it’s just going to be a towel for now. Also, I’ve been taking a supplement developed especially for joints called SuperCissus Rx. It’s made from the Cissus Quadrangulis plant and is used in the steroid community apparently as ‘roids weaken the tendons and ligaments. It’s supposed to increase blood flow to the tendons and ligaments. I have no idea how effective it is but at least it gives me the comfort that I am doing something proactive instead of just laying around. If anyone has been using this, I’d love to hear your thoughts. If anyone has any questions, please feel free to ask. Hope you all get a good PT too. Mine plays basketball so he has sympathy for my injury.